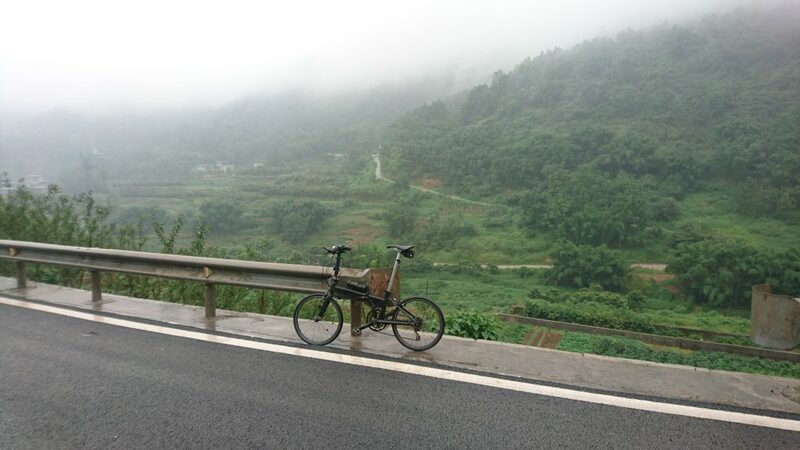 The Virtues of mixed-mode travel with a folding bicycle. There is an infinite number of ways of travel, but our nature and force of habit let us stick to just a few. 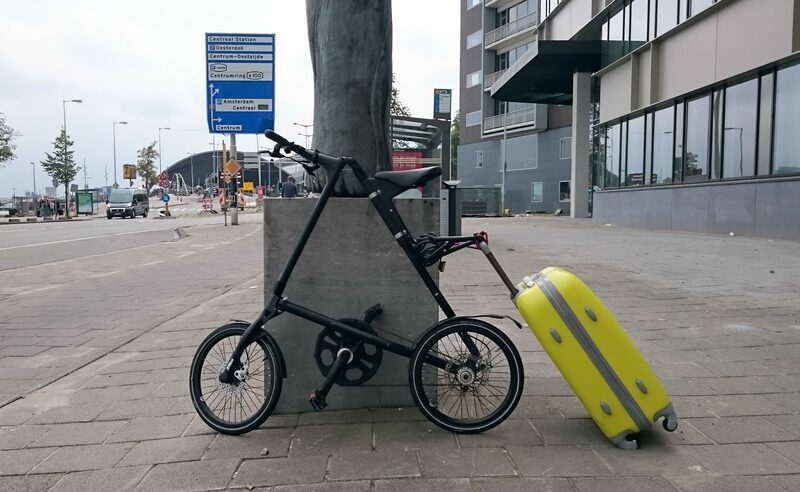 I love traveling by and with a folding bike for the very reason, that it allows me to jump between these different modes of transportation and the different planes and worlds on the road. Take a plane, train, bus or boat and throw in a bike ride for a day or two. Be flexible and not rely on taxis or figuring out public transport in another foreign city. 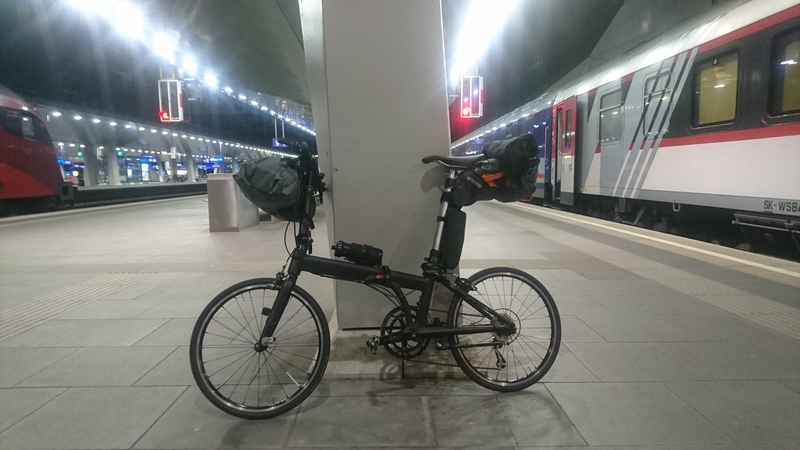 This report sums up some of my preferences and experiences with the folding bicycle way of life. It is not a buyer’s guide. As with any bicycle, finding the right bike is difficult and highly subjective. 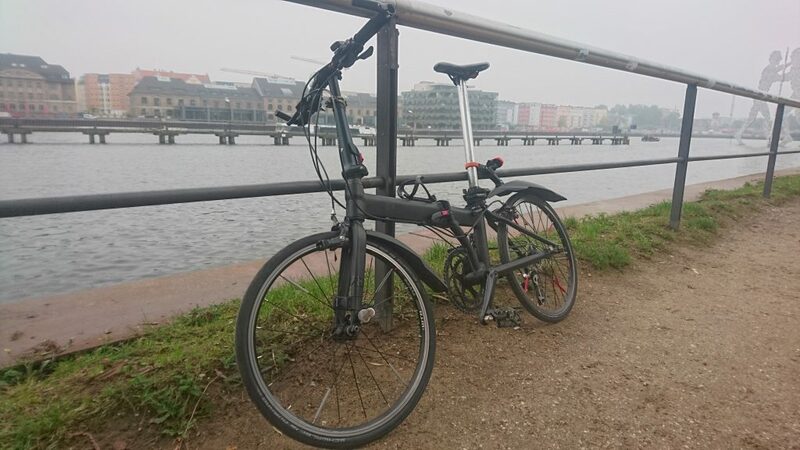 Besides, finding the right folding bike always involves a compromise: Do you want it to pack as small as possible or ride as fast and comfortable as possible? My first folding bike was a triangle. It’s also called Strida SX, a belt-driven folding bike with an A-shaped, collapsible frame. Originally designed as a master’s project for the Royal College of Arts by Mark Sanders in the early eighties it went into production soon after. 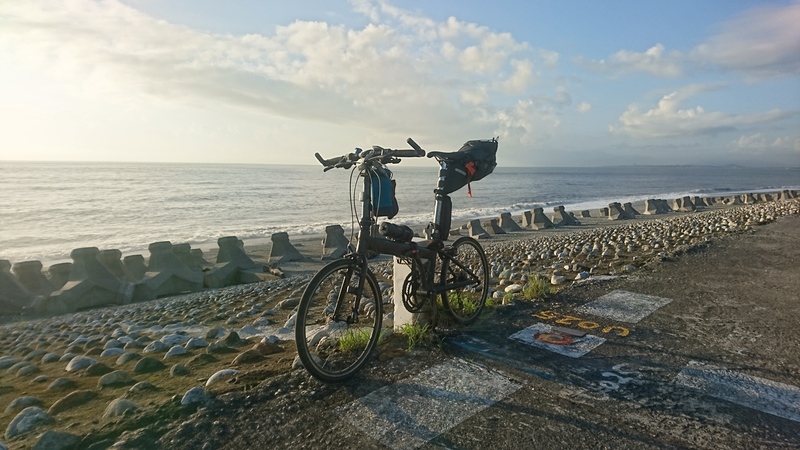 It never gained many followers in the UK competing against Brompton, but got somehow popular in Asia, and is currently produced in Taiwan. 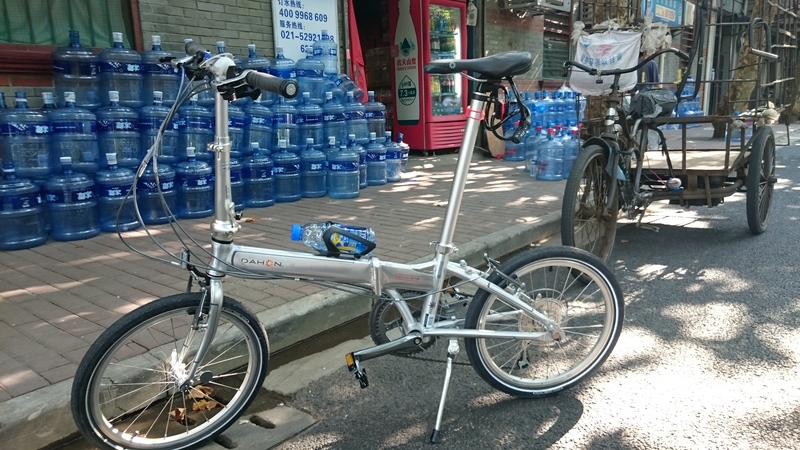 My second folding bike was a shiny, silver Dahon produced for the Chinese market only and got stolen within 48 hours. I was devastated, but it might also have been a sign. The bike was fancy but heavy. I had no idea how to pack or fold it for traveling, and after a period of grief, I invested in another folder, along with a good lock. Shiney and new but stolen within 48 hours..
“You will have a truly unique bike,” Bill told me. 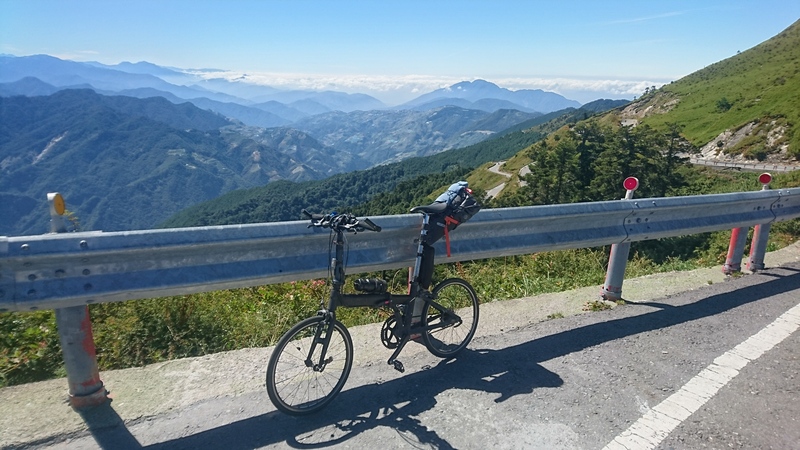 Bill is an US-citizen living in Shanghai, also dealing with customized folding bikes and operating cycling tours in China and East Asia. I did not realize how right he was when I bought my third folder from him, second-hand and overpriced and entered an extended period of love and hate relationship with this piece. I would not buy it again, but through hard work, we grew together and it developed into the bike I still travel around with. Its original manufacturer is called Langtu, and except for China I only found it to be distributed and sold in Russia. It was customized to some degree, derailleur, saddle, and pedals were non-original improvements, but not too much. It got a typical 18-speed road gear setup, but due to smaller wheels more suitable for climbing than high speeds. The other good thing was, it also came with a bag, protective linen inlay, tools and a personal introduction by Bill on how to fold and how to best package it for travel and flights (But I guess the consultant fee was included in the price). For the next while though this bicycle kept being a source of frustration and anger. 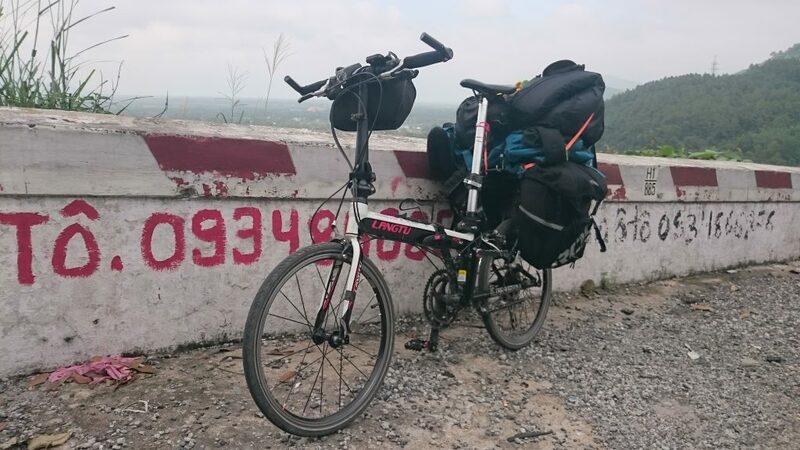 I did a few rides but mostly carried it through China, with spoke after spoke cracking until I found a Bulgarian mechanic in Hanoi, Vietnam, also the first bike mechanic in a while whom I found a language in which to communicate with fluently. He convinced me that the radial spoked wheel design was terrible by design choice and re-did both wheels with crossed spokes. 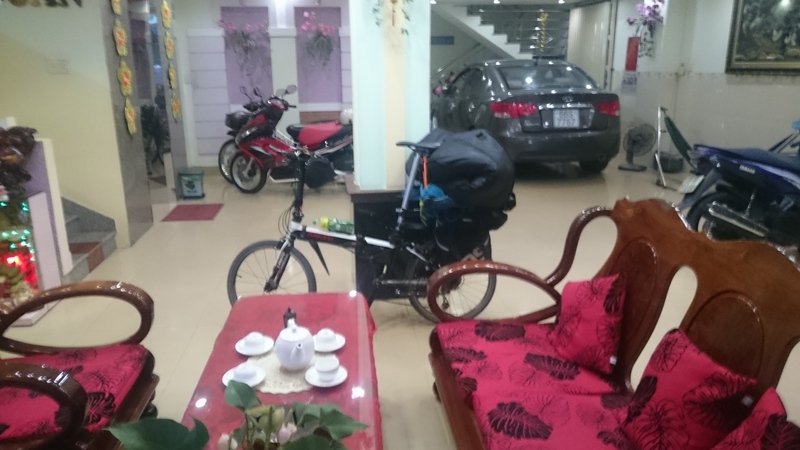 It cost me just a few bucks and was good for a few days rides through Vietnam, packed with all my 20 kilograms of luggage and the few thousand kilometers in the year afterward. China and Vietnam was also the place where I first got into mixed-mode traveling, jumping back and forth between train, bus and boat rides, and cycling for day or two – for instance from Hue via Hai Van pass to Dan Nang, or two days from Ho Chi Minh City along the Mekong Delta up to the Cambodian border. The setup therefor was heavily improvised: I got two cheap panniers in China, that could fit into my backpack when in need to be carried or onto a removable rack when cycling. 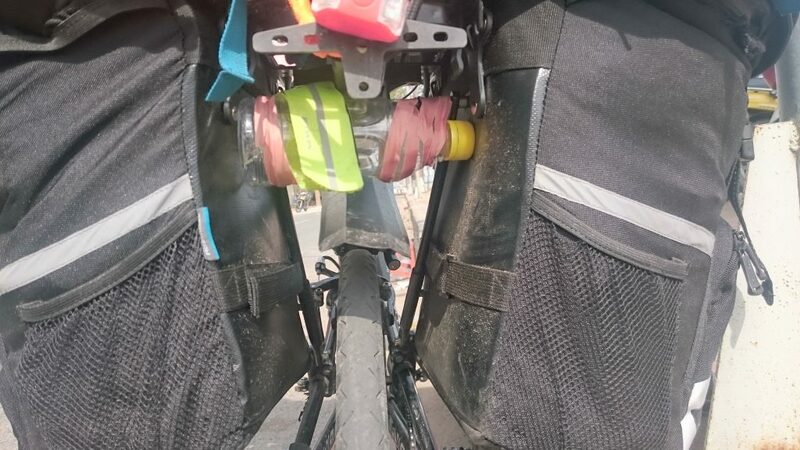 The panniers tore on first use, and the setup was far from perfect. 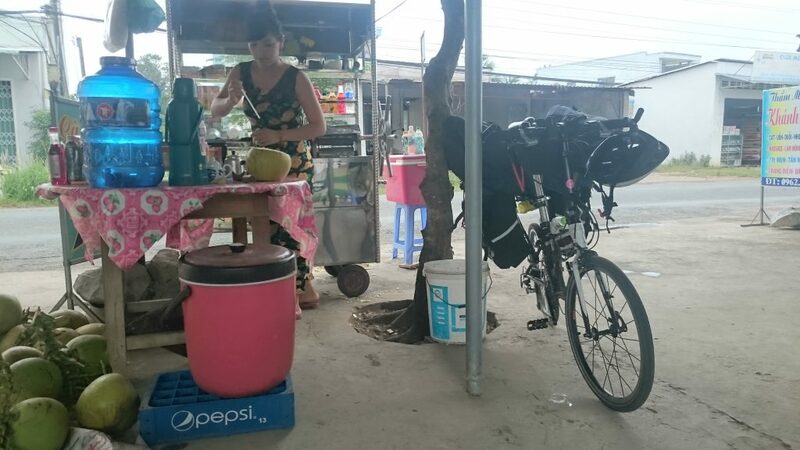 Lugging around a huge backpack and a huge bike bag was bit cumbersome, but it worked and made me hungry for more. The pros of this “unique” folder are also its weakness. It has the less common 20″ x 1-3/8″ (451mm) wheels. A friend and Birdy-rider noticed after doing a brief test ride: “It rides like a real bike.” It’s not precisely correct, but the large wheels add up to the riding comfort, and it feels closer to a real sized bike. It’s a bit like a road racer among the folders. The disadvantage then of course is: it is comparably huge. It’s still a piece of oversized luggage and not just a regular suitcase. Eventually, spokes started to crack again, and I invested into a light, narrow and fast German-built wheelset, added 28mm road tires, repainted the bike and started to customize and tune up a bit more. From the original weight of 10,5 kg, I got it down to – depending on configuration – somewhere between 9 and 10kg including lock (I eventually exchanged the bulky lock for a lighter one again. The primary protection is to never let it out of site), turning it into a real black foldable road cruiser. 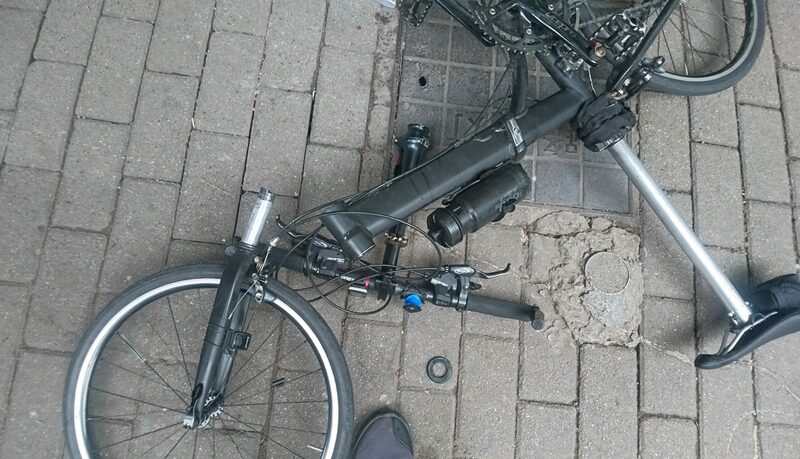 Admittingly, I never had that many breakages with any other bike. Partly it is because of poor design by the manufacturer, but I also credit the heavy wear on the bike. For one this is riding it in all kind of weather and road conditions. But be aware that travel and transport add to wearing out parts and materials a lot. You can never package the bike perfect enough, and you never know what happens outside your control. So it does require constant maintenance and repairs, which I now do mostly by myself if necessary learning on the go (But I would consider and recommend disc brakes and hub gear if getting a new bike for this very reasons). Forced stop with a broken fork in Chongqing. I continued experimenting with and improving my bikepacking and gearing setup. 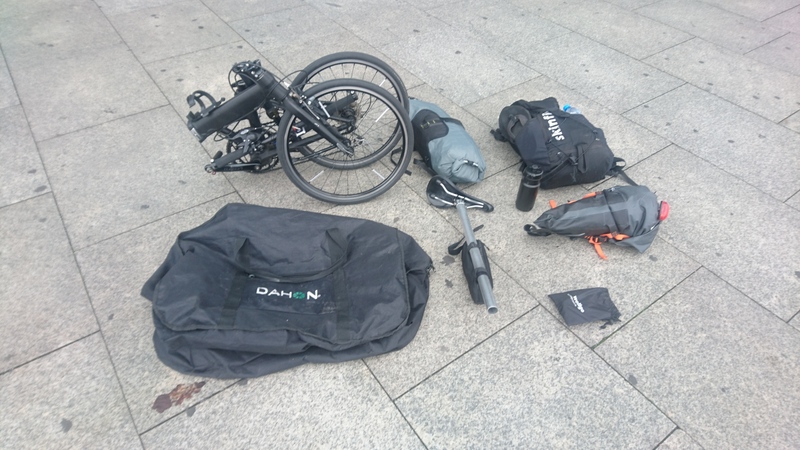 I usually take a bike bag from Dahon with a thin layer of protective padding with me (currently I use the backpack carry bag); it neatly folds down to a handbag sized package that can be tied to the bike. For shorter trips – and if not flying – I might carry a thin bike cover. For checking in the bike during flights I get 10 to 15 meters of bubble foil and wrap the bike into it before putting it into the bag. I might add improvised extra protection (cardboard, clothes) around sensitive parts. The foil can than reused or dropped according to the situation and one gets a new one in each hardware store for little money. 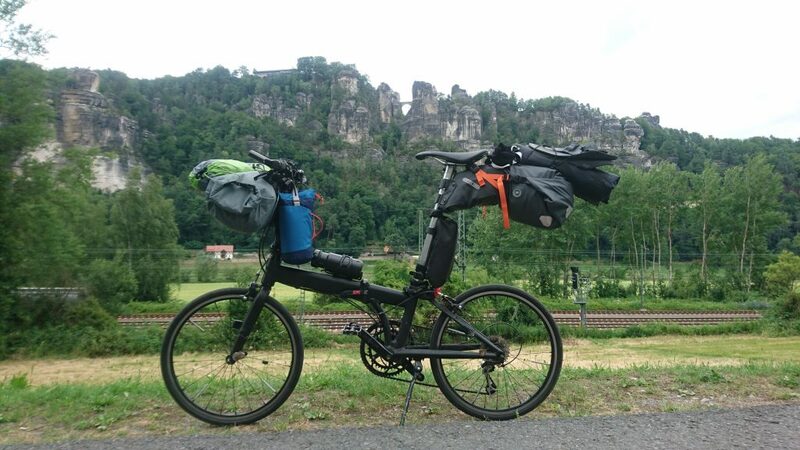 I eventually tossed using the racks and panniers – it did not fit this bike at least and turned to bikepacking. I now use a handlebar bag and large saddle bag. When packing up the bike for traveling these can be easily stored in the bike bag as well or carried by hand. I usually also use a small backpack for additional stuff, and laptop or other electronics. 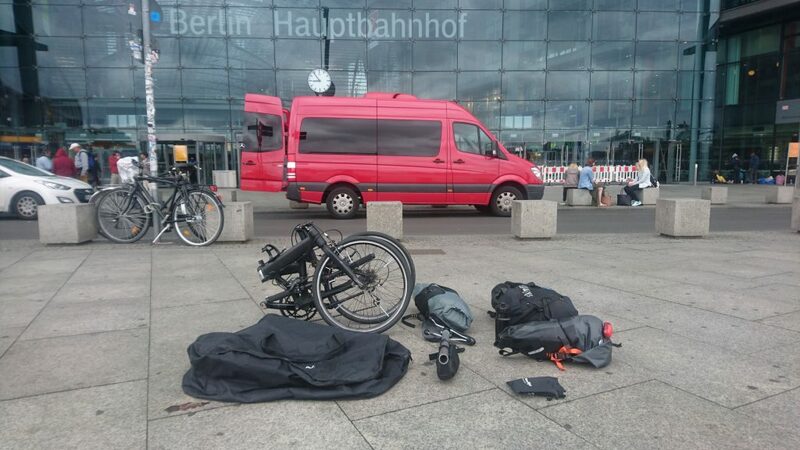 … and getting off and re-packing in Berlin. Nowadays, I rarely go anywhere without a folding bike. Flying with a bicycle will – for the time being – always be cumbersome. I prefer the train anyways. And for any land-based travel modes, the practice of jumping off a train or bus and hop on a bike is addictingly convenient. Even if equipped for being on the roads for weeks, converting from packing everything in carry-on bags or packing everything on the bike just takes me a few minutes. 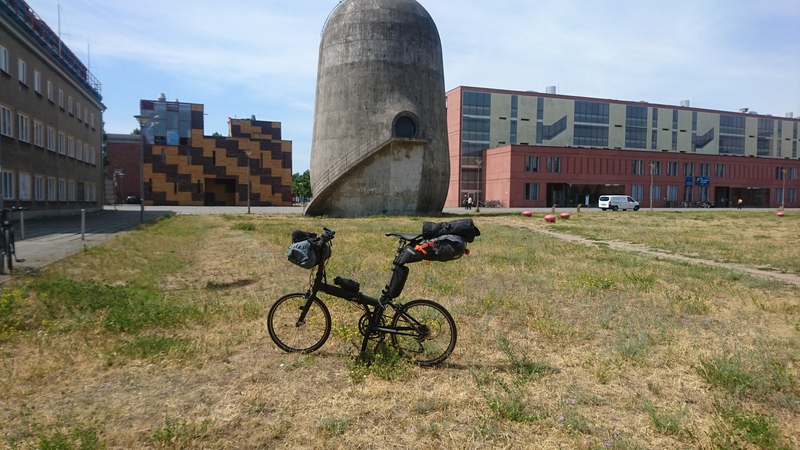 There is no way better to explore foreign cities or landscapes as by bike. Navigation is easy with contemporary smartphones, GPS, and free offline OpenStreetMaps. 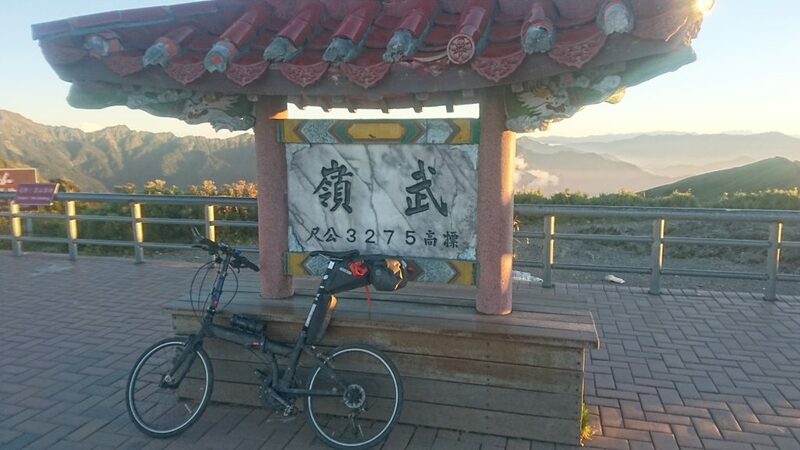 Its perfect for commutes and city to city usage (For instance I regular travel between Vienna and Berlin), eventually I hop on the bike for a real 100 mile ride, explore the surroundings of Paris or the Rhine between Cologne and Bonn, or tackle a challenge and climb up a mountain from sea level to cloud level, as on Taiwan’s Hehuanshan.